It was never my intention to write about cats… or to write mysteries. In fact, I knew nothing much about either of them, apart from an adolescent fascination with Baker Street. Little did I know that my own Sherlock Holmes would be a cat, and my Doctor Watson would be a journalist with a large moustache that twitches when he encounters foul play. Story-telling came to me naturally and early, and I wisely wrote about things I know: Girl Scout camp-outs, high school baseball, the eighteenth century French court. Strange to say, all my stories had unhappy endings, and many tears were shed in my $15 typewriter, prompting my mother to say, “Why don’t you write something that makes you laugh?” I tried, because I was brought up to believe that mother knows best, but darned if I could think of anything funny! At that time I was unaware how funny cats could be. When I was an adult with a husband and a career in advertising and an apartment in a high-rise building with a view, I finally acquired my first pet. He was a Siamese kitten whom I named Koko after a character in “The Mikado,” and the two of us were on the same wave length. He obviously knew what I was thinking, and I seemed to know what made him tick. Such was our empathy that it became usual for people to call me part-cat, a remark I accepted as a compliment. Imagine my grief when, at the age of two, Koko was killed in a fall from a tenth floor window! Imagine my horror when neighbors told me he had been pushed! I began having nightmares about members of my family falling from great heights, and I knew I had to write about the episode in order to cope with my distress. The result was a short story titled “The Sin of Madame Phloi,” a tale of crime and retribution told from the viewpoint of a Siamese cat. 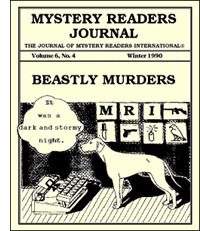 It was published in Ellery Queen’s Mystery Magazine, and the editors asked for more cat mysteries. Then a publisher asked for a mystery novel involving a cat, and The Cat Who… series was initiated. Many cats have since shared my life, providing inspiration and ideas, but it was the original Koko who launched my fiction career, and The Cat Who… series is a memorial to him. Naturally the hero of the books is a Siamese named Koko, short for Kao K’o Kung, who is smarter than people—or at least smarter than the journalist with whom he lives. Koko is no supercat; he neither flies nor drives a car no speaks English. He merely sniffs and scratches in the right place at the right time, enabling Jim Qwilleran to uncover clues. Mother was right. I laugh a lot while writing these catly spoofs. As subjects for mysteries, cats are clever, funny, independent, subtle, wily, profound, inscrutable and—yes—mysterious. And there are no two alike. But if you’re going to write about them, it helps to be part-cat. I came to birding through my husband. With our marriage, I acquired two malodorous suitcases of rotting skulls and birdwings and the information that he had given up a secure job in industry to work a three month contract for the Royal Society for the Protection of Birds, the conservation charity. It was an education. I had thought all birdwatchers were spotty school boys or strange old men. This was, after all, before it was fashionable to be green. Suddenly I was introduced to a whole world of birders. I discovered there was a social hierarchy, a system of etiquette, even a language. I discovered that we all had lists. A birdwatcher’s list is the number of species he has seen in his country of origin and people whose sole object in birdwatching is to extend their lists are known as twitchers (listers in the States). They chase rare birds from the Scilly Islands in the southwest to Shetland in the north and keep in touch with up to date news through a telephone answering service called Bird Line. It was the obsessive quality of this form of birdwatching which fascinated me. What drove people to such extraordinary lengths to glimpse a bird, perhaps only for a second? In an attempt to explore this obsession my first novel, A Bird in the Hand, was written. Soon after our marriage we moved to Hilbre, an otherwise uninhabited tidal island close to the Wirral peninsula on the west coast of England. The island was a nature reserve and my husband was made warden. We lived in an old light-keepers cottage, without main water or electricity but with magnificent views of the waders which roosted on the rocks at high tide and a seal colony which hauled out onto a nearby sand bank. During our time on Hilbre, Tim trained to be a ringer (known as a bander in the States). Birds are caught in traps or nets. They are weighed, measured and a tiny, numbered ring is fitted to one leg, then they are released. The pattern of retraps has helped scientists to discover the main routes of bird migration. Volunteer ringers came across the sand each weekend to man the bird observatory and we soon got caught up with the pattern of observatory life, watching for the south westerly winds which would bring small migrants to the island. While we were there I started writing—what better setting for a traditional detective story?—and the result was Come Death and High Water. My third book, Murder in Paradise, is set on an island too, but Kinness is far more remote than Hilbre. In Murder in Paradise I use the experience of having lived for a while on Fair Isle, one of the Shetland Isles. Although bird-watching plays less of a central role than in the other Palmer-Jones books, I hope that the natural history of the place adds to a sense of its wildness and provides an interesting background to the story of an enclosed community. My husband’s first job for the RSPB was to help protect birds of prey in Wales. We spend an idyllic summer there, walking the coastal path to check if peregrine falcons had returned to their traditional eyries, working with volunteers who looked after the birds on their land. Yet there were a disturbing number of thefts. Egg collectors stole the eggs of the rare red kites and unscrupulous falconers took the young peregrines for use in their sport. In A Prey to Murder I look at the trade in wild birds of prey and the measures which are taken to save them. I am not a birdwatcher. I would not spend all day in the rain waiting for a rare warbler to emerge from a hawthorn hedge, or get up at dawn every morning in the hope of trapping a bird which has been ringed thousands of miles away. But I love the exposed and beautiful places where birdwatchers congregate and I’m amazed by their enthusiasm. In the same way I hope that even those readers with no interest in ornithology may enjoy these books. Have you ever wondered why, in Walt Disney cartoons, Mickey Mouse can talk and Donald Duck mouths off continuously and even Goofy (whatever the hell he is) has the power of speech, but poor old Pluto can only make dog noise? So much for equal rights in the Magic Kingdom. Up until five years ago, that sort of anti-cur prejudice would not have raised my hackles. Then, I held no brief for man’s best friend. Nor had I any first-hand knowledge of the beast. The change occurred when I published my first mystery novel, Sleeping Dog (not to be confused with Let Sleeping Dogs Lie, Sleeping Dogs Die, Let Sleeping Afghans Lie and the myriad of other similar titles that have appeared since). Because of that, everybody assumed I’d been a member of the kennel club for years. I was asked for my advice on flea allergies, incontinence in senior mutts, mastiff mating techniques. I would patiently explain that I hadn’t owned a dog since I was seven years old, and that one passed away from distemper before I really got to know her. The dog dilemma deepened with the second Bloodworth-Dahlquist adventure, Laughing Dog. The titular reference here was to a work of pop art—a parody of “The Laughing Cavalier,” with a spaniel’s face. (This distinction was apparently lost on my publisher, since the art motif on the cover was an ominous studded dog collar curved in the shape of a smile.) It was at this period — several months prior to publication of Laughing—with visions of sequels named Dancing Dog, Barking Dog, and maybe even Saratoga Dog racing through my noggin, that I began to think I really should get to know a little more about canines. So I went to the animal shelter and found one. His placid face may be seen on the dust jacket of Laughing Dog‘s hardcover—a 75-pound Bouvier, a magnificent black sheep dog indigenous to Hercule Poirot’s part of the globe, who answers to the name of Beau. Genial but territorial, Beau has gradually taken over most of our home, gleefully chasing away salespeople and friends alike as they arrive at our door unbidden. While I finished my third book, the forthcoming The Burial Society (which follows a character from Laughing Dog back to his home in New Orleans), Beau worked on his projects—digging holes in the garden, terrorizing the neighborhood cats and perfecting an exercise that consists of his rolling on his back and wiggling his feet in the air. It’s very similar to a dance they do in Louisiana’s Cajun Country called The Gator. I don’t know where Beau picked it up, probably from watching TV. In any case, Beau will be a major character in the next Bloodworth-Dalhquist story, Devil Dog (which, if everything goes as planned, will appear sometime in 1991). His name will be changed to Hoagy, and he will assist the detective and Serendipity in trying to locate a young woman who may or may not have been a member of a Satanic cult. The helpful hound has been a staple of detective literature at least since Doyle’s day, but Hoagy is not quite the loyal and eager companion that Sherlock’s Toby was. Which is to say, he may be capable of saving the detective’s life, but he will also insist on eating Bloodworth’s favorite slippers. My initial idea for writing Sleeping Dog was to see if I could come up with a reasonably hardboiled novel even though one of the protagonists was a descendent of Nancy Drew. The addition of a black sheepdog might push Devil Dog over into the cozy category, but I don’t think that will happen. It’s not that kind of story. And, just as Serendipity is not at all similar to Nancy Drew, Hoagy is not a Disney dog. He may be amusing at times, but he’s just as apt to be cranky and obstinate. He may not be able to talk, but he has bite.